Three new games to be released at Blackjack Ballroom! Enjoy playing the 3 great new games this month, and don't miss the Double Points promo below on one of Blackjack Ballroom's most popular games ever! Pull up a chair, snap open some chopsticks and whet your appetite for wins with So Much Sushi; the game that serves up spicy spins, wasabi-infused wins, and no less than FIVE fresh Free Spin features! 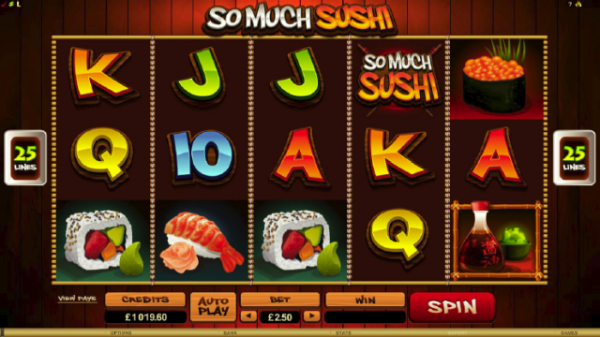 If that's not enough to get your tummy rumbling, try a sprinkling of the brand new Much More Sushi feature, where winning sushi symbols split to offer wins of up to 25 of a Kind! Each Free Spin feature offers its own unique number of Free Spins, ranging from 8 to 16, as well as unique payouts per line. Have a quick bite with 8 Free Spins offering wins of up to 160,000 coins per line, or take your time with 16 Free Spins offering wins of up to 80,000 per line. Whether you prefer Crab or Cucumber Rolls, Sashimi or Shrimp, it's all on the menu in So Much Sushi at Blackjack Ballroom Casino. With a minimum bet of 0.25, and a maximum jackpot of 32,000, you could be dining in style! Also, do take a stroll down memory lane to a fully-stocked candy store and stock up with the tastiest treats and crunchiest cash rewards on the reels. This candy-bright 5 x 3 Reel, 25 line game features Wild and Scatter symbols, as well as retro style music and bright, sugary candy symbols that hark back to simpler times of Pick 'n Mix in paper bags from your favourite old sweet shop. 3, 4, or 5 gumball machine Scatters on the Reels sweeten the deal by triggering the Choose Your Feature screen. Give your inner kid the run of the candy store by taking your pick from 5 tantalising Free Spin features. Grab a quick, chewy morsel with 8 FreeSpins offering wins of up to 160,000 coins per line, or indulge your sweet tooth with 16 Free Spins offering wins of up to 80,000 per line. Whether you're a fruit drop fanatic or a gum drop guru, you're sure to find your favourite on the Reels of So Much Candy. With a minimum bet of 0.25, your favourite treat is well within your reach, and with a maximum jackpot of 32,000 up for grabs, So Much Candy is guaranteed to fulfil even the sweetest of cravings. Join the mischievous monsters in this unique 5 x 3 Reel, 25 Payline game which is creeping and crawling with strange looking creatures. Kick start the action in the Base Game with weird Wilds and strange Scatters. With a minimum bet of 0.25, those heart-pumping payouts are well within your reach. The Many More Monsters feature is where the real thrill begins. Land 3 or more monster symbols on a payline, and each Monster can split into 5 monsters, wriggling in some massive wins! Get ready for a myriad of monsters, and up to 25 of a Kind payouts! 3, 4 or 5 eye-balling Scatters anywhere on the Reels trigger the Choose Your Feature Screen, where you can take your pick of 1 of 5 freaky Free Spins features. Release your inner monster in this quirky game, and with wins up to 32,000, you'll be clawing for more. So Many Monsters, So Much Candy and So Much Sushi are available in your casino from September 3rd, 2014. Have a great September. Goodbye August and Welcome September! Grande Vegas Says: "If you want to be happy, be"